Batman: Arkham Knight is the closet anyone will ever come to being the Bat. Spanning the length of a cordoned off Gotham City, its citizens having evacuated their lives and their homes thanks to a Scarecrow terror plot, Arkham Knight places Batman at the center of the power vacuum left by the Joker’s death at the end of Arkham City. Leading the charge is a new foe, the titular Arkham Knight, whose militia moves into Gotham with a speed and ferocity unlike anything Batman has experienced. That’s not to say he’s not somewhat prepared for it. In the nine months since he closed the door on Arkham City, Batman has been arming up, and through WayneTech R&D, has produced some truly scary equipment that severely pushes his No Killing rule to its limit. At the center of this initiative is the Batmobile, a weighty, muscular beast of a car/tank armed with a wide array of both lethal and non-lethal weaponry. As the newest feature of both the game and Batman’s arsenal, the Batmobile is featured throughout, with many portions of the main story focused on its combat prowess, and a ton of side content built around racing its beastly form through Gotham’s streets. In car mode, the Batmobile tears through anything in its path. Light pole? No problem. Concrete blockade? Like butter. Thugs driving random cars through the streets? Pushes them out of the way like Batman’s real name was Mr. Plow. In fact, halfway through New Game +, I’ve learned to simply let it hit what it will, as driving the Batmobile has more in common with steering an angry bull then an actual car; you point it in a direction, and hold on for dear life. This design decision runs counter to the often precise movements needed to excel at many of the game’s side activities, most notably the Riddler Death Race portions, but I never found it so frustrating that I had to put it down. More often than not, I found myself trying to do too much and with a beast like the Batmobile, overcompensation can be deadlier than doing nothing. It’s a hard lesson to learn, and one I don’t think the game eases you into at all, but after a time, it does begin to feel like second nature. Thankfully, apart from the portions that require you to drive, Batman can take to the air at virtually any time, and gliding over Gotham has never felt more right. It's fast, efficient, and with the proper upgrades, ridiculous fun. Adding to the pleasure is the seemlessness of Gotham proper, with no loading or pop-in even on the furthest of sights, flying over the city, whether in the rain or simply to ever present glow of the moon, is one of the most beautiful things in video games today. Outside of it's brutish driving mode, the Batmobile also functions as a tank. With a simple push of a button, the lumbering behemoth begins an agile dancer, capable of pinpoint movements, albeit at a greatly reduced speed. 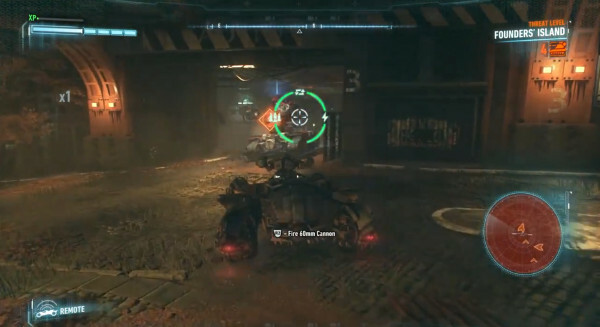 Combat scenarios throughout the game place Batman in hectic battles against battalions of unmaned drone tanks, annoying drone helicopters, and even stationary missile emplacements, each one of them bent on turning his tank into a crater. With one exception, an optional tank battle accessed through a side quest, I never found these situations to be too difficult, as they tend to ramp up in difficulty at the same rate in which Batman unlocks better gear. Extras like an EMP blast, and a hacking tool go a long way to making even the most hectic engagements easy to deal with. Even when the encounters shift gears and take on a more predatory style, I never felt there was anything I was ill-equipped to handle. That being said, it doesn’t mean that all the car stuff doesn’t feel slightly out of place. Batman has always been at his best scaring the hope out of thugs from the shadowy corners of confined spaces, and while the roar of the tank is sure to reduce some rioters to a crumbling sack of sobs, it also leads to quite a bit of imagination stretching when it comes to Batman’s No Killing rule. More than once, I shotgunned around a corner only to find a group of rioters in the streets. Some dodged, some weaved, but many were struck by the rumbling behemoth. Sure, Rocksteady shows them falling to the ground, shocked by the Batmobile’s anti-personnel combat measures, but it doesn’t quite explain how they survived being run over. When he’s not tearing up the streets of Gotham, Batman still delivers his patented brand of punishment through the Free Flow and Predator systems. With our last exposure to the best third person combat system available being slightly tainted by Arkham Origins inability to deliver consistently on the tried and true formula, I was absolutely thrilled to see that it is once again tuned to perfection. Batman continues to jump, jive, and wail his way through thugs, whether large, small, armored, or electric. There are some new wrinkles thrown into the equation, like medics that can wake enemies back up, or goons that employ the tried and true “Rush him down” method by running at Batman and screaming, but these amount to nothing more than additional threats to prioritize. Bats is also able to utilize portions of the environment for takedowns, further stretching his rule by slamming thugs into electrical panels, or dropping light fixtures on their heads. 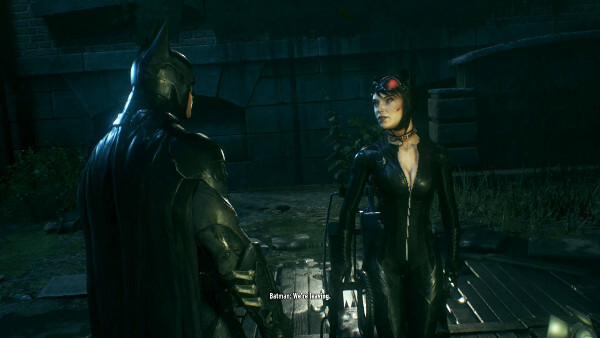 Also new to Arkham Knight is a team up mechanic, where by a member of the Bat Family, be it Robin, Nightwing, or occasional rogue Catwoman, joins Batman in a round of free flow combat. Switching between the two is as easy as a single button press, and with each enemy that drops, a meter fills that adds a takedown maneuver to the switch. The dual takedowns are flashy in all the ways they should be, with the slowdown effect turned all the way to 11 as the instigator launches the chosen foe at their partner, and the receiver breaks them in all the wrong ways. While the additions are meant to always keep you planning two or three moves ahead of your current combo, it's all to easy to get bogged down in all the different permutations thrown your way. Trying to remember that red lines over a running enemy are countered with a Batarang, while the same over a shield bearer mean dodge are easy when they are alone, but when compounded with the big Brutes who have taken the place of their armored comrades, or goons that have been electrified and can only be dealt with by gadget, there were a few times when even I shook my head and grunted in frustration. 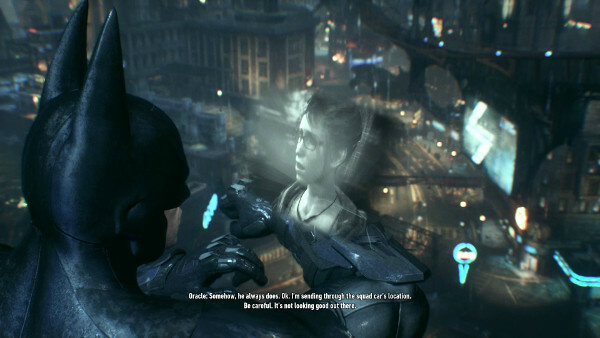 Thankfullly, it's missing all of the problems that were present in Arkham Origins, so that angry reaction at being overwhelmed is something that will go away with time and training, and not prone to return everytime Batman whiffs and punches the air to his right rather then the poor criminal to his left. 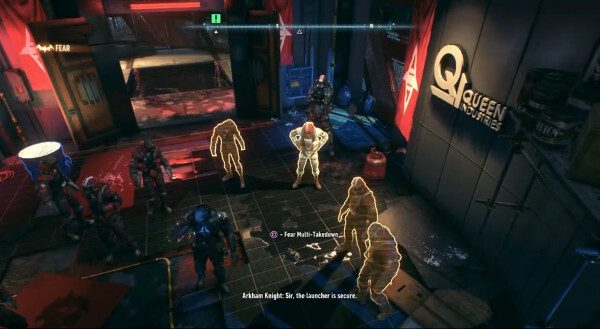 The Predator system hasn't changed much over the length of the series, with Batman still at his best when he is able to watch and take his time with his approach, but Arkham Knight has increased the ways he can deal with threats by a magnitude of ten. Mobility, both before and during takedowns, has been tuned, allowing for multiple takedowns at once through the Fear system, and a number of environmental options thanks to gadgets like the remote hacker and disruptor. I have never had more fun playing through encounters, and setting up baddies for the perfect takedown is a breeze once you've unlocked all the gadgets. The AI has also been upgraded, with enemies able to adjust to Batman's tactics if you use the same method to dispatch to many of them. Having touched on all modes of combat, and the Batmobile, the only thing left to talk about is the story. Where I normally would have started with this aspect, as lore tends to be what makes or breaks a game for me, I left this to last because Arkham Knight's story is simply that damn good. True to the comic book style, the story is dark and gritty, leaving Batman and his closest allies in some truly tough spots. Skipping spoilers, this is easily my favorite of the stories, and while certain parts may truly test how far your imagination will stretch, it nails each and every story beat it shoots for. 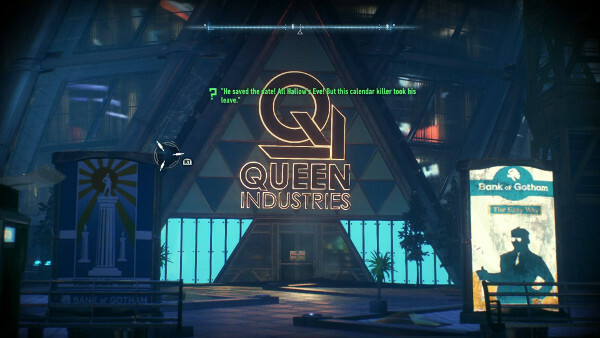 Bat fans will probably be able to guess the identity of the game's titular villain, but it's the other stops along the way that truly amaze, including what is, quite possibly, the best use of one of Batman's foremost villains in any story, in any medium. I won't spoil it, even though it's been two weeks since release and has no doubt been all over the web, but it is, without question, my favorite thing about this game. Also, once you've beaten it, do yourself a favor and start up New Game +, even if just to catch the first couple minutes again. Take my word for it, it's worth it. Unlike Arkham Origins, which felt like the Arkham story's unwelcomed little brother, Arkham Knight earns its position as the end of this triolgy. It goes out hard and fast, carrying one of comics most iconic characters into an unknown twilight, and leaving us with Rocksteady's undisputed triumph over the licensed game space. I have no doubt you will see this game on my year end list, and like the others, I can't wait continue exploring it for years to come. I enjoyed the experience quite a bit but spent more time thinking about all the things I couldn’t do over the things I could when it was all over. It’s a well-crafted experience and one that I would recommend to anyone jumping into the Playstation VR at launch, but my hope is that years down the road we get a more fully realized Batman VR experience.